Drinking: Coffee, coffee and more coffee. Voila! With the valentines about-to-be-mailed it seems safe enough time for a reveal! 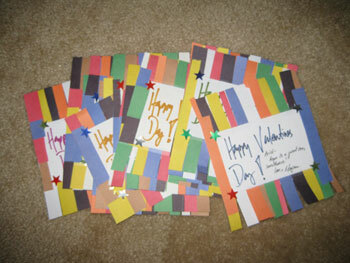 (Above) The backs of the valentines, withthe spiky version of my handwriting scrawled. (Above) And the fronts! 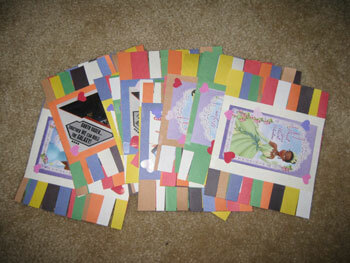 As you can see they're schoolyard valetines with construction paper fringer. Went with Star Wars, Hot Wheels, and The Princess and the Frog, picked up at the dollar store. (Above) All sealed up and ready to go! 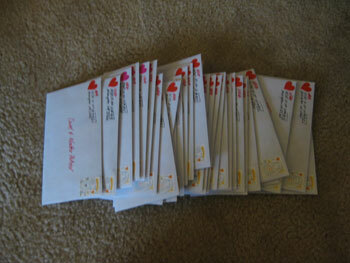 Plan on actually mailing these in the next day ot so. Depending on a) The mailman coming to pick them up (have no idea what Arlington County has going on re: service), b) Where you live (folks in California, of course it'll take longer) and c) Whether or not I'm sending you one (if it seems you would have and didn't feel free to email) they should be arriving soon. Exciting! Or at least as exciting as anything is in this mad mad weather. Doing (life and related tasks): Making itthrough another dayof snow. Doing (crafty stuff): See left. Wanting: To be finished with these - they're fun but I'm at th epoint where its time to get on to the next project. Anticipating: Hug coming back after a couple of days at her beau's.